Anna will be driving and I'll be on the phone all afternoon tomorrow. Every puddle has a duck in it with little fluff ball ducklings. All kinds of species, both American and European widgeon in the same pond with mallards and Icelandic geese, black necked geese, swans, gadwalls, scaulp and tuffed ducks. These are eiders which are everywhere along the coast. Really getting me fired up about being in Argentina next week. Within 2 weeks I will have seen dozens of waterfowl species on 3 different continents. Best of all, I get to put those South American ducks in my hand and eat them. Incredible views from the road and as you can see, waterfalls are everywhere. Congrats to Capt. 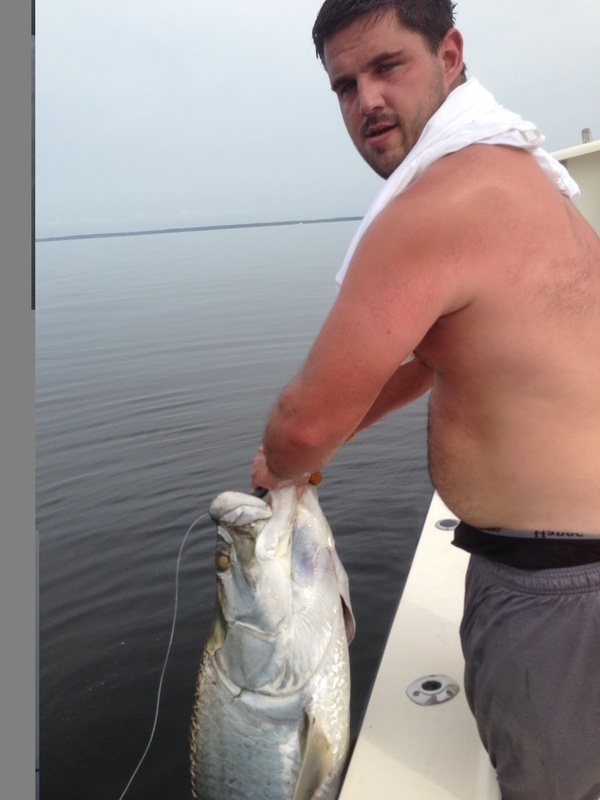 Phil for catching the first reported tarpon of the year on the Pamlico Sound. 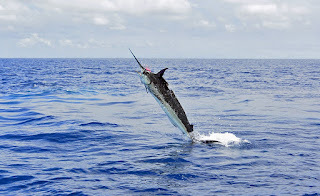 fished 3 days, raised 19 blue marlin, got 8 bites on the fly rod using heavy tippet and caught 6 blue marlin on fly rods. That is pretty cool stuff. Having trouble loading pics, more to follow I hope. Taxes are very high on alcohol, so we got rigged up in "Duty Free", but for two days I couldn't find any ice for sale anywhere. I guess after 9 months of winter, they don't want to see any ice for a while. I finally chipped some off of a glacier to cool down the beer and for a block in the bourbon. Another thing, it's really hard to get a good night's sleep around here, I've seen the moon, but it hasn't gotten close to dark since we've been here, 24 hours of sunlight really screws with your clock. Second night in town we were staying at a fishing lodge, although there were no fishermen there, it's a little early for the salmon run, which by law requires you to hire a fishing guide, minimum fare starts at $1500/person/day up to over $3000/person/day. Yes this does include lunch, but it turned Anna off to the idea of making this a fishing vacation. I was talking with the lodge manager and he lit right up when he found out that I was a fishing guide. He started talking about all the other fishing opportunities they have in Iceland, trophy trout and other stuff that you can do on the cheap. I stopped him right there and told him that this was not a fishing vacation, that I was doing whatever she wanted to do. His reply with a big smile that he could hardly retain: "No fishing? Really? Hee, hee, hee, that's too bad"
Stay tuned, pics that don't give this place justice to follow. Capt. Chris Kimrey had a bang up day yesterday with MAXIMUM PULLEDGE . He crushed the aj's. If you want your best shot at getting a big fish to put in your lap, well, those amberjacks are about as consistent as the giant red drum and there's not a lot of difference expect where you're catching 'em. Whether an aj or a giant drum, now through October is when you want to go. It's happening inside and outside right now. ......but an awesome sunset yesterday afternoon while fishing from the beach. Capt. Roy on the pink panga was on the bite and begging me to go, baiting with me some of these pics to prove that he was catching 'em. Sometimes there aren't enough hours in the day or days in the week. At least I did get into some of the best tarpon fishing in the world. Capt. Jake is taking off tomorrow on another FAD trip, in search of blue marlin on the fly. I'm on the way back to NC for a week in the office with Anna. Since I was "play-fishing" in stead of "work fishing" this past week, I doubt I'm going to be able to get my head out the office.....unless it really is "light and variable", I'm sure there is some silver in the Neuse. June 9, 2015: My good friend and client, Danny Cline and I boarded “Dragin Fly” at Los Suenos Marina, met up with Captain James along with his crew Berto and Marcos, and headed out toward a place I call Blue Marlin Destination - X- #7 and #8 (BM D-X- #7). We left the dock at 1:30 PM ran straight out for an hour, then deployed our teasers and set up our fly rods for billfish. At 3:00 PM we raised a big Sailfish, it teased in quickly, Danny Cline made a good cast, and six minutes later we released a 100 pound plus sailfish on 20 pound, class IGFA tippet. We continued running at trolling speed all night and arrived at our destination at 4:00 AM. June 10, 2015, Danny and I woke up at 4:00 AM smelling sausage and eggs, and a pot of great Costa Rican coffee brewing, while we were over 140 miles from the marina, out in the ocean. After breakfast, we cleaned up, and began deploying our teasers, and getting the fly tackle ready for some Blue Marlin fly fishing. By 10:00 AM we had raised six Blue Marlin, Danny Cline was the angler, he got three Blue Marlin to bite his pink and white “Cam Sigler” tube fly. The first fish ran 50 foot, stopped, shook it’s head and the fly fell out, the second bite was not a legal bite as the Marlin ate the fly before Danny could make his cast, this fish went deep, and Danny broke the class tippet as he didn't want to waste time fighting a fish which would not count, the third Blue Marlin which ate Danny’s fly, hit the fly with it’s bill, however it never came tight so, even though we call it a bite, it was never hooked. Fishing slowed down between 10:00 and 2:30 and then between 3 PM and 3:30 PM, we raised 3 more Blue Marlin, One ate the teaser, and jumped before letting go of the teaser, the other two didn't tease into casting range. As the sun set and it began to get dark, we have raised 9 Blue Marlin and had three bites today, that is an awesome day of fly fishing, even though we have not caught a Blue Marlin yet on this trip. We will sleep aboard out here in Marlin World, between 8 PM and 4 AM, and then start all over again tomorrow. June 11, 2015, After a shower, a great Breakfast, and a couple cups of coffee, we deployed our teasers at 5:00 AM. Our first Blue Marlin raised was at 5:50 AM, it came in hot, swam past my fly, and up under the boat before fading away without eating my fly. At 70:30 we raised a Striped Marlin, this fish never came to the fly, and we never saw another fish that morning. At 9:05 AM, Captain James and I decided that we would leave and steam about 130 miles to the southwest, to a sea mount which I call "Destination, Blue Marlin - X - #1” (“DBM-X-#1). We never raised another fish until 4:15 PM when we came onto a piece of floating stuff, at which time we raised, two Blue Marlin, and a big Wahoo, none of which teased in for a bite on our fly. We arrived at our destination at 11:00 PM and went to sleep, No Fish Today! June 12, 2015, After a hot shower and a good breakfast between 4 AM and 5 AM, we deployed our teasers, and got the fly tackle ready. James spoke with the captain of “Fish Tank” who had fished here yesterday, he raised 20 Blue Marlin between 9 AM and 3 PM on June 11th here, so we feel that this is the best location to spend the last day of this Blue Marlin School. We raised a Blue Marlin at 5:35 AM which did not tease into range, we saw Fish Tank catch three on bait before 7:00 AM, The conditions are good, with relatively calm seas, lots of bait, but slow fishing for the fly boat. There were five boats fishing on this spot, with only the boat which was fishing with live bait getting any fish. At 10:00 AM Captain James and I decided to pick up and run about an hour to a sea mound (BMD-X-2), which is a little closer to shore and on which there were no other boats fishing. We arrived and put our teasers in the water at 11:00 AM, Fish Tank had run past us on the way over and hooked a Blue Marlin just as we arrived. Three minutes later we raised a red hot 150 pound, Blue Marlin, which teased in, and ate Danny Cline’s well presented pink and white tube fly, and the battle was on (for a short time), when that Blue Marlin kicked in the after burner and as he was 150 yards out and flying away, the 20 pound tippet broke and this Marlin was gone. Then at 11:42, a red hot, 250 pound Blue charged in on the bridge teaser, Danny cast the pink and White CS popper fly on 20 pound class tippet, and that Marlin ate it big time! At 12:01, Danny Cline released his first Blue Marlin of this trip, and his sixth Blue Marlin on 20 pound class tippet, on fly, in his lifetime. By 1:15, we raised 8 Blue Marlin, including 2 double headers, at this location, (BML-X-2), We got a total of four bites of which three flies came out on a jump, while Danny caught and released that nice fish. It is now 5:30 PM, we never raised another fish today. As we pull our teasers out of the water, and begin our 13 hour trip back to Los Suenos Marina, the final score from this, my first, “Blue Marlin Fly Fishing School” of the 2015 season is as follows. We raised 20 Blue Marlin, one Striped Marlin, and one Sailfish, We had 7 Blue Marlin bite the fly and jump at least once, and one Sailfish bite the fly, Danny Cline caught and released a 100 + pound Sailfish, and a 250 pound Blue Marlin, both on 20 pound test, class tippet, on fly tackle, while using IGFA rules. Two years into my Costa Rica Blue Marlin Fly Fishing School Series, all of my Students (Anglers) have caught at least one Blue Marlin on fly! 100 percent success!, I love my job! Today, June 13, 2015 I am in my condo at the world class, Los Suenos Resort, Danny is on his way home to West Virginia, my good friend and client Hugh Chatham is here with me and Craig Machado will arrive tomorrow. My buddy George Beckwith, (Dragin Fly owner) is here until tomorrow. We are planning the rest of our Summer season for my "Costa Rica, Blue Marlin Fly Fishing School" series fro June, July, August of 2015. We do still have one week available during the first and possibly second week of August, other than that we are sold out during this season. We are heading back out on Monday, stay tuned for more action from "Blue Marlin, Fly Fishing World"! The boys left 3 days ago with Jack Jordan and his good friend Danny on a multi-day trip fishing for blue marlin. 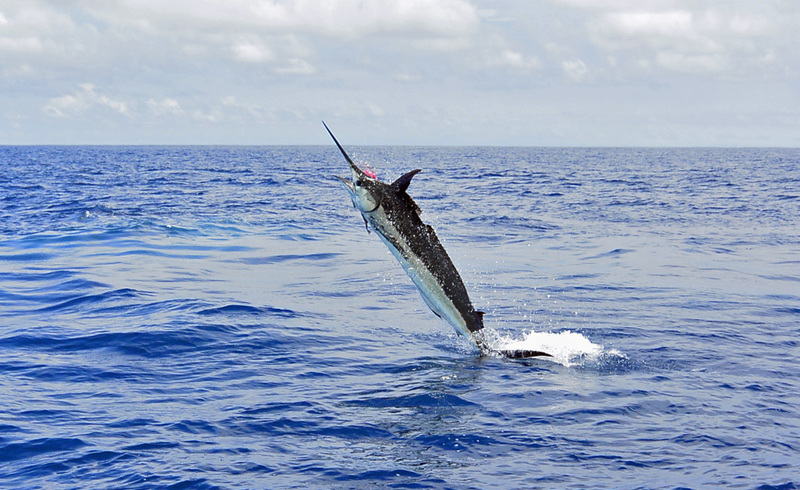 If you don't know already, catching a blue marlin is a pretty big deal. It's HUGE to catch a blue marlin on the fly. Sounds like congratulations are in order, I got the call on the SAT phone this morning that with another half day of fishing, they had raised 15 blue marlin, got 5 bites on the fly and caught at least 1 blue marlin on the fly. That's pretty cool stuff. Complete report when Jake Jordan returns. ....two double digit days of tarpon and I'm taking off to the other side to greet the Dragin Fly, returning from a multi-day trip to the seamounts, fishing for blue marlin on the fly! Here are some pics of inshore action going on the pink panga. Tarpon pics from Silver King Lodge to follow. I'm down here on "business", lining up details for next year and sending Capt. Jake Jordan and his friend Danny off on the Dragin Fly for some fly fishing for blue marlin. Last year Danny caught several blues on the fly with us and they are hoping to duplicate that success. Yesterday afternoon I got the call that the seas were calm and the tarpon were biting at Silver King Lodge, so I hopped on a helicopter with my friend Marc and we were tarpon fishing at 1 pm this afternoon. By 4:30 we were spent, landing 15 tarpon!!!!! Pretty much a continuous double header every time we put a bait in the water. We had 3 or 4 little 20-40 pounders but most of them were respectable fish approaching 100 pounds.....which is about as big as I want 'em. Congrats to the Run Off! Congrats to the Run Off, Marty and Capt. Brian Harrington and their angler Stephanie Avent for winning the Kelly Wagner Lady Anglers tournament with a blue marlin release and a 22 pound dolphin to break the tie. Now go get a grander Brian and Marty! After fishing 18 out of the last 21 days, I have caught at least one keeper cobia every single day. We haven't had the big numbers or the big fish that the guys up at Hatteras have had, but we have had a pretty consistent season. Mixed with good bottom fishing and the amberjacks and plenty of sharks, it's been completely entertaining for everyone involved. Hopefully this good fishing is going to continue through June and into July. 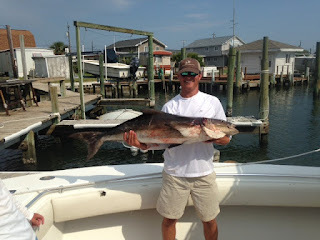 That slug of cold water up at Hatteras that kept the cobia hemmed up there may also be diverting more tarpon into the Pamlico Sound than in years past when many tarpon seem to have passed us by and gone to the Chesepeake. with a 54 pounder and 4 of her friends. 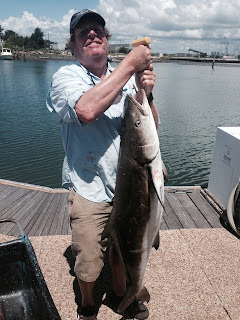 Thank you Hugh for keeping the streak alive with this 50 pounder.